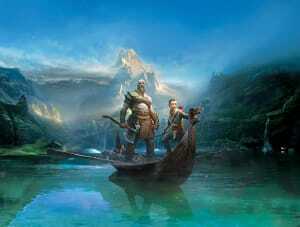 The official God of War fine art print collection celebrates the exquisite art behind the award-winning game. 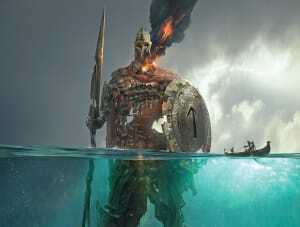 The collection features 6 gorgeous prints that depict various memorable scenes and settings from the game, and includes some of the very first concept art drawn for the new God of War setting by Spanish concept artist José Cabrera, as well as a stunning print by senior concept artist Abe Taraky of a statue of Týr, half submerged in the Lake of Nine. God of War 4 (2018) is an action-adventure video game developed by Sony Santa Monica Studio (California, USA). 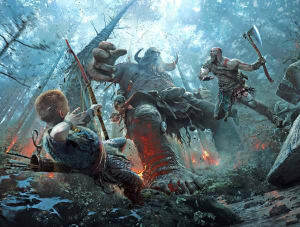 The eighth installment of a highly successful series, God of War 4 again features the towering Kratos as its iconic protagonist. 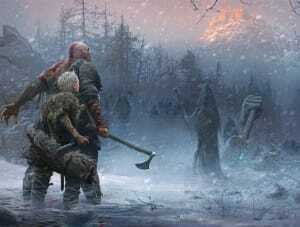 In God of War 4 the Greek god trades the bloody wars of the Olympus for the tranquility of a Nordic forest, where he lives a quiet life with his son Atreus. 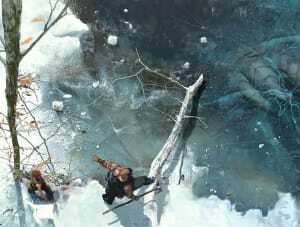 Setting out on a quest to deliver the ashes of Atreus' mother to the highest mountain peak in the region, Kratos is soon tasked with something inherently impossible: to keep his son from a life of violence while slashing his way through the throngs of trolls, wood elves, and Norse gods that bar their progress. This central dichotomy informs God of War 4 in all its interlocking aspects. Tonally, the game shifts from gentle, funny, and often heartfelt family bonding moments to the brutal fighting the God of War series is known for. One moment father and son engage in subtle conversations about various aspects of life, while the very next moment may see a troll get ripped to gory pieces. These tonal shifts extend into the general art direction of the game: the game world, a realistic pre-Viking world in which Norse mythology springs to life, is rendered beautifully, often leaving the player gasping for air when taking in all the scenic beauty. Yet the very next moment, he/she may confront another realm of realism: that of the ugliness of battle, the deformity of trolls, or, on a deeper level, Kratos' thirst for blood, the dark character trait he desperately tries to hide from his son. The game exells in how these opposites are visualised. Sitting at a comfortable point in the life cycle for PlayStation 4 - a powerful machine from 2013 that, after many years of service, holds no secrets to game developers - God of War 4 highlights the technical and graphical prowess of the console, rendering beauty and ugliness in the same ultra-realistic fashion. The game is a showcase for current-generation game animation, texturing, and audio design, and profits from a strong art direction that focuses on story as well as on combat, on strong character development as well as on tight combos. The end effect is an outstanding action-adventure video game that peaks at both the action AND the adventure parts.